Okay, I’m definitely not Dutch. But last week I picked up my renewed residency permit. This means I’m welcome to legally live among the Dutch for at least one more year. And if I’m lucky, they’ll find me fit to stay even longer. If I do decide to stay in the Netherlands forever and ever, I’ll have a choice of constantly renewing my residency in periods of up to five years, becoming a permanent resident, or applying for citizenship. But let’s not get ahead of me on this. My renewed residency, along with my current academic focus on immigration and integration, has me thinking about what all of this changing of residency means. Now that I’m a “resident”of the Netherlands, has anything changed about me, other than my legal status, that makes me any more of a local? I’m pretty sure it hasn’t. I’ll be considered American for the duration – even if it is forever and ever from now. I can have a local address, pay taxes, speak fluent Dutch, ride my bike everyday, and eat bread and cheese with every meal. I can even become a naturalized citizen. No matter how long I live here, or how hard I might try to assimilate, I’ll never be Dutch. And I’ll never be mistaken for Dutch (though the thought is kinda funny). I’ll only ever be a resident in someone else’s country. Please don’t get me wrong. I don’t believe in assimilation. And I don’t want to be Dutch. But I do find Dutch exclusivity to be quite fascinating – more as it relates to folks who have been living here for much longer than I. In the States we have this “melting pot” concept, of which I have never liked the thought or sound. But now that I’m out of that context, it’s starting to make sense to me – the concept of one pot of Americans who look, speak, behave, and believe differently – all identified as “American,” regardless of the number of generations their families may or may not have been in the country. That’s not so much the case here. If you’re Dutch, your parents are Dutch, and of course their parents are Dutch. For all of these years, in spite of a long history of colonizing countries of the black and brown, Dutch people have managed to maintain this “pure” ethnic group (at least for now) in their country. Although immigration is on the rise, and the country appears to be relatively diverse, with plenty of black and brown people living at least in the major cities (many coming from former Dutch colonies and speaking Dutch as a native language), the newcomers aren’t and will never be Dutch – even after a full generation. 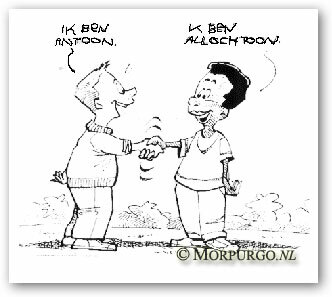 Rather, the term used in the Netherlands to describe any person who is not native Dutch (with two Dutch parents) is allochtoon. "I am Antoon." - "I am Allochtoon." Allochtoon is a fascinating concept, one which I do not fully understand. It’s been explained to me as strictly a technical term that applies to all first-generation immigrants, as well as the children of immigrants, even if they were born here. But then it also seems to come with assumptions. If you look or sound like you’re not from here – like, hm, let’s say maybe you have some color – you’re allochtoon. And since a distinction is made between western and non-western allochtoons, race seems to be a central issue to the way the term is used colloquially. How must that feel to live in your home country and have a category applied to you that maintains a distinction between you and your white Dutch peers? Doesn’t this make it easier for Dutch people to maintain whiteness as a defining characteristic of Dutch-ness? Is it possible – really possible to be black Dutch? How many generations will that take? So I’m definitely allochtoon. If I have a child with even the dutchiest of dutchmen, my child will be allochtoon. And if my child has brown babies (gosh, I hope s/he does), those children may still be viewed as outsiders – not because they fit the formal definition of allochtoon, but because their appearance will mark them as different – foreign – yeah, allochtoon. Of course I’ll teach my children and grandchildren that they are indeed different due to their ancestry. And they better love and embrace those differences. But damn, I wouldn’t want them to be forced into a falsely prescribed social category that will pass judgment on their (lack of) Dutch purity. That seems…not nice. I am not one to shout from the hilltops that “I’m American!! !” But it’s nice to know I have the option. Come on, PURITY? This is the Netherlands, don’t let me laugh. Ever heard about pillarisation? This is a country with a strong tradition of “voluntary” segregation. Leaving people in their own socio-religious environment. You are still talking about a country with three different Christian TV-guides. As such the possibilities for a fairly large group to become rather insular, conservative of their own alien values and enforce certain demands on the whole of society are pretty large. You are “allochtoon”, sure, but “westers”, so you are supposed not to be associated with a problem. Looking into, say, teen pregnancy, it turns out that girls from the Antilles are facing unmarried teen pregnancy 4 times as often as average. On the other hand, the leading group in teen abortions are the Surinam girls… Both groups are however standing out in acceptance of cross-cultural marriage, so it’s not all bad mind! Let’s not start about honor killings. Well, ofcourse I do disagree with all stereotypes, but your text came across as pretty offensive too. Especially your prediction, in case you stay in the Netherlands, and you will have grandchildren, in say 25 years, chances are great that by then there will be another word, to indicate the “special” ethnic monority groups and whether that will include you and your family remains to be seen. Sorry, but I was helping Piet to send you your early St.Nicholas gift. And that was not easy at all. And really, Dutch do not like to be call “racist”. I mean we tend to be so busy with discriminating on religion, political views, income, accent, origin, culture, sexual preference and age, that we just don’t have the energy to start worrying about such an outdated concept as race. Well, you are actually wrong here. Because you are an American, you will be put into the group western allochtoons. People from Suriname and The Antilles are punt in the group non-western alochtoons, for some reason. As you will be a western allochtone, there will be no help for you, because your groupe is doing well in all statistics and clearly is in no need of help. I kind of didn’t like it – this putting stickers on peoples head and putting them in groups. But anayway, the idea behind it was a good intention. Clearly, types like Wilders now use those statistics with no good in mind.